The following tips should help you find your missing pet. • Ask your family and friends to help you. The more people are looking and calling for your pet, the better. Then quiet down and listen very carefully for your pet to make any noises. • Create flyers with a photo and brief description of your pet. Don't forget to mention where the pet has been lost, and your contact details (however, do NOT write your name or address!). Distribute the flyers within a close radius of where it was lost. • Ask your neighbours to let you know if they happen to have any information about your cat or dog. Give them a few flyers you created. • Advertise. 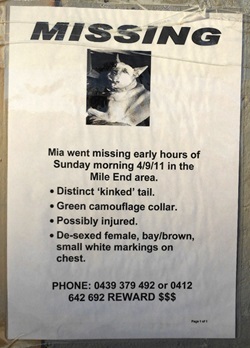 Place a "lost pet" ad in your local newspaper. Keep checking the newspaper for "found pets" ads every day. • Offer a reward for finding your pet. • Let your Animal Control Officer know your pet has been lost. Give him or her a few flyers, and ask to be on the lookout for your cat, dead or alive. • Call your vet. If your pet wears a rabies tag on its collar, the number will sometimes be traced to your vet. • Call veterinarian emergency clinics and ask them whether a pet matching the description has been brought in. Ask them to let you know if this happens. Keep calling them every day. • Visit your local animal shelter and ask them to let you know if a cat or dog matching the description has been brought in, dead or alive. It's also a good idea to keep visiting the shelter daily because no one can recognize your pet better than you. This will also ensure the shelter workers don't forget to keep you updated. No one can be more responsible for finding your pet than yourself! • Spread the information about your lost pet via the Internet. Social networks like Facebook have helped many pets and their owners reunite. • Don't despair. While this doesn't happen very often, sometimes cats and dogs are found weeks and even months later after they were lost. • Last but not least, if you haven't already, consider microchipping your pet to increase its chances of being found if it gets lost.